Screenshot from surveillance video of crowd outside the Last Chance Lounge at 18th Street and Girard Avenue in North Philadelphia shows Shaquille Rainey holding a gun Nov. 8, 2014, moments before Nafis Owens, 25, was fatally shot. The fatal shots were fired by another man, lawyers contend. There was no public outcry when a troubled 25-year-old named Nafis Owens was fatally shot in a November 2014 gun battle in North Philadelphia. He and an accomplice had helped instigate the mayhem near 18th Street and Girard Avenue that sent bystanders ducking and diving, surveillance video showed. Owens was hit by two bullets from a 9mm handgun: One lodged in his back, the other cut through his ribs, liver, heart, and lungs, the Medical Examiner's Office said. As one of 248 homicides recorded in the city in 2014, this one might have passed unnoticed. Owens, after all, had recently been released from prison after a five-year sentence on gun and drug charges, and was killed the same evening he allegedly robbed other patrons outside a bar. But what has happened in his case since that night — a chronology that the Inquirer and Daily News pieced together through public records, court testimony, and interviews — offers a window into the often tangled and sometimes flawed criminal justice system in one of the nation's most violent cities. Three men were charged in the killing. One spent 17 months in jail before prosecutors set him free, acknowledging that the only witness against him had lied. The two others were acquitted. The judge herself called the case particularly weak. Prosecutors from the Philadelphia District Attorney's Office stubbornly pursued a case against the wrong men even though there's little dispute about the identity of the real killer, say the former defendants and their lawyers. Owens' father disagrees. So the killing officially remains unsolved, stirring the question: Will there be justice for Nafis Owens? The sidewalk outside the Last Chance Lounge at 18th and Girard in Francisville was more crowded than usual shortly before 10:30 that Saturday night, Nov. 8, 2014. A cookout had been underway for hours, hosted by a woman trying to raise money to hire a lawyer for a loved one. Eddie Slater Jr., a lifelong resident of the neighborhood, was frying fish and chicken under a sidewalk tent when Owens and another man approached him. Owens — on parole — was visibly drunk. The second man, clad in a jersey bearing the number 99, brandished a 9mm handgun and pressed it to the chest of the 37-year-old. Owens then reached into Slater's pockets and pulled out $20. Not long after, the same duo moved to their next target, 37-year-old Shawn Timmons. Owens pressed the gun to Timmons' chest in a failed attempt to steal his bicycle. Owens wasn't a stranger to the North Philadelphia community. He had grown up with Timmons' younger brothers, Tariq Timmons and Shaquille Rainey. When the brothers arrived at the cookout they found Owens outside the bar and confronted him. In a scuffle partly captured on surveillance video, Tariq Timmons grabbed Owens' shirt collar and shoved him against a parked van. Owens was shouting as Timmons and Rainey hustled him around the corner onto Girard. Rainey drew his own weapon, keeping it pointed downward. As the group turned the corner onto Girard, the video showed a second man – the one in the 99 jersey – also brandishing a gun as he crept up behind Rainey and Timmons. Then the gunshots erupted. Owens collapsed, and the crowd scattered. Owens died on the sidewalk. The next day, Rainey and Timmons voluntarily went to the police. They explained that Rainey had fired his gun in self-defense when Owens' accomplice pointed his gun. The cops let them go. Nine months later, no charges had been filed in Owens' death when city prosecutors got a tip from a jailhouse informant. The tipster, Mikel Smith, was also from the Francisville neighborhood. He said that he'd been waiting for a trolley at 19th and Girard when he saw the shooting, and that he could identify the killer. He implicated a man named Kevin Prince. Prince was also local, and friends with Timmons and Rainey. But on the night of the cookout, the 25-year-old professional DJ and graduate of the Art Institute of Philadelphia was sitting in a bar four miles away, watching a Bernard Hopkins title fight. Still, based on Smith's tip, police swarmed on the house Prince shared with his 85-year-old grandmother. He was arrested and jailed without bail on a charge of first-degree murder, as was Rainey. Tariq Timmons was charged with third-degree murder and freed on bail. The three had previously only had minor brushes with the law: Prince had a conviction for disorderly conduct; Rainey was convicted of loitering; and Timmons had convictions for DUI, marijuana possession, and operating a vehicle without an inspection sticker. As his client sat in prison, Prince's lawyer, David Nenner, began burrowing deeper into the investigation. He explored Prince's alibi, got the surveillance video from outside the Last Chance Lounge, and looked more closely at the prosecution's central witness. Smith had a long criminal record — and incentive to help prosecutors. In early 2015, Smith had been indicted as the triggerman in the armed robberies of four grocery stores and a Dunkin' Donuts. His plea negotiations with federal prosecutors began within weeks of being charged, and he was still looking at possibly spending decades behind bars. Helping to solve a murder might help lighten the punishment. Prince was important to the prosecution's case for one reason: Although Rainey admitted that during the confrontation outside the bar he had pulled out a gun – one legally owned and registered — the bullet that killed Owens didn't match his weapon. So investigators didn't have a shooter. But the defense lawyers did. The word on the street, they learned, was that the gunman was an 18-year-old named Keahn Morrison. Nenner pulled his criminal record. All of Morrison's brushes with the law had been in the 22nd Police District, where Owens was killed. Just two weeks after Owens' death, police had responded to reports of a shooting near Morrison's home along 23rd Street. The victim, shot in the upper right thigh, was unwilling to talk, but police retrieved a bullet casing that matched the casings fired from the gun that killed Owens. Nenner, the lawyer, got a photo of Morrison and had his investigator show it to Slater. The sidewalk fish-fryer confirmed that Morrison appeared to be the man in the 99 jersey who had pressed a gun to his chest outside the Last Chance Lounge. That fall, Nenner took his case file to the District Attorney's Office and asked prosecutors to reconsider the charges. They declined. They wouldn't have had to go far to find Morrison. He had spent much of the year jailed on weapons charges. Even when he finally was released in October 2015, it wasn't for long. By Christmas, he was back in, charged with attempted murder. In early 2017, convinced that Morrison was the gunman who killed Owens, Nenner appealed to the defense lawyer representing Smith in his federal robbery case. The lawyer, Thomas Burke, went back to the jailhouse informant and pressed him to tell the truth. Smith then admitted he had made up the claims about seeing Owens' shooting. With their star witness gone, prosecutors had no choice but to drop the charges against Kevin Prince. In March 2017 – 17 months after being arrested on the faulty jailhouse tip — Prince was freed. But the District Attorney's Office wouldn't drop the charges against Rainey and Timmons. Instead, they marched ahead toward trial. In January, a jury was impaneled to hear the case against Timmons and Rainey. Now Nenner was representing Timmons, and Rainey was represented by Jason Kadish. The two lawyers didn't mince words: From the outset, they told jurors that evidence showed Owens was killed by friendly fire from his partner in crime that night, the man wearing the 99 jersey — Keahn Morrison. They introduced the surveillance video that showed Owens and Morrison together outside the bar prior to the shooting; the forensic evidence pointing to a matching bullet casing found near Morrison's home; Eddie Slater's eyewitness identification of Morrison; and Morrison's arrest and 2016 guilty plea on two unrelated attempted murders. Nenner even subpoenaed Morrison, having him brought into the courtroom so Slater could point him out to jurors. Assistant District Attorney Deborah Watson-Stokes, the prosecutor who had rejected Nenner's assertions about Morrison more than a year earlier, tried to rebut the evidence. In a move that shocked defense lawyers, she called to the witness stand Morrison's mother, Ebony Morrison, who told jurors that the man seen on fuzzy surveillance video wearing the 99 jersey was not her son. He didn't even own such a shirt, she said, adding that she would know because she buys his clothes. In the end, attorneys Nenner and Kadish prevailed. In a rare courtroom putdown after both sides rested their cases but before the jury began deliberating, Common Pleas Court Judge Diana Anhalt acquitted Timmons of all charges, telling Watson-Stokes: "I just don't think you have enough evidence against Tariq." Then Anhalt threw out the first-degree-murder charge against Rainey and replaced it with third-degree murder and voluntary manslaughter. "I've thought about this for four days, and I've been waiting to hear the evidence that is going to pull it all together, and it's not there," the judge told them, according to a transcript obtained by the Inquirer and Daily News. "It really just isn't there. I'm going to sleep well with this decision." The final blow came from the jury. On its second day of deliberations, the panel acquitted Rainey of all charges. The conclusion of the case — three defendants, no convictions, and evidence pointing to a fourth man who has not been charged — troubled at least one juror. "I walked away not understanding why 99 wasn't charged," said Arnold Bolden, a 71-year-old real estate salesman. "I believe 99 shot the boy. There was only two guns out there, and if [Rainey] didn't shoot him, then it had to be 99." Bolden said he and most of the other jurors did not believe the testimony of Morrison's mother, and that during deliberations they had agreed the prosecutor was poorly prepared for the trial. Nenner said the District Attorney's Office wasted time and money and, more important, locked up men who didn't deserve to be jailed. "What's offensive to me about this whole thing," Nenner said, "is that in September or October of 2015 at the latest, I gave Deborah Watson-Stokes my entire investigation, and the attitude was, 'You're wrong.' And more importantly, no one looked any further into what we were saying in all those years that went by." 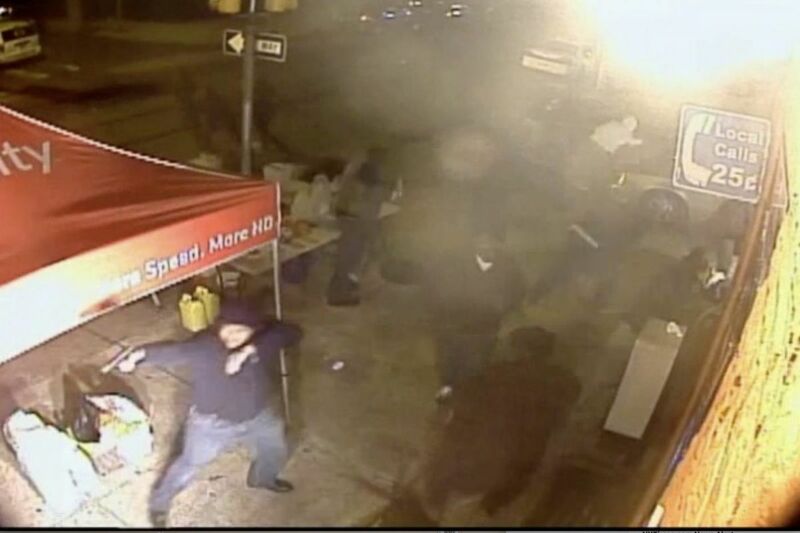 Screenshot from surveillance video of crowd outside the Last Chance Lounge at 18th Street and Girard Avenue in North Philadelphia moments before shootout that killed Nafis Owens on Nov. 8, 2014. The District Attorney's Office declined to allow Watson-Stokes to respond to questions about the case. District Attorney Larry Krasner said he was troubled by some of the defense attorneys' allegations. "We are always concerned when there is evidence that seems to indicate another possible theory," Krasner said when asked in February. But he said it would not be appropriate to say if the office would investigate Morrison. The men once accused of killing Nafis Owens have moved on, seeking normalcy. Tariq Timmons is working in construction. Prince landed a job as a machine operator for the Tasty Baking Co. Rainey says he has not been able to find a job despite turning in a handful of applications. The 30 months he spent in jail waiting to be tried and the trial's aftermath have left him feeling resentful, including at the prosecutor. "It was a weak case. She's wrong for taking all that time away from me," Rainey said. "That was wrong." He is convinced that Watson-Stokes' zeal to prosecute him stemmed from her frustration about another court case that she lost in 2012. In that case, a murder trial against his cousin, Rainey was supposed to be a key prosecution witness, but recanted on the stand and said homicide detectives had beaten and threatened him into making incriminating statements. Owens' father, Rob Hamilton, is also bitter. He believes that the three former defendants should have been convicted. Reached by phone last week, he cursed the three, the court system, and a reporter. Morrison remains in prison. He got 8 to 16 years for an unrelated attempted murder in December 2015. And Owens' murder remains unsolved, at least officially. "What this says is Nafis Owens never got justice, because Nafis Owens' killer was his co-conspirator that night robbing people," Nenner said. "The bottom line is, he's the one that pulled the gun and escalated the situation. He's the one that made it into a gunfight. He got away with murder."